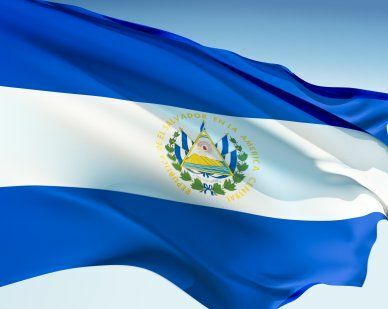 The original El Salvador national flag was similar to that of the U.S. Featuring blue and white stripes with a red square in the left corner and 12 white stars, this flag was used from 1865-1912. In 1812 two flags emerged with 3 horizontal stripes; blue, white and blue. The first flag featured a white stripe with a coat of arms at its center. The second flag boasted a gold inscription "Dios Union Libertad." In 1972 the flag became official. Our top-quality El Salvador flags conform to all official specifications. Emblems and designs are executed with the highest possible degree of accuracy in regard to detail, color shades, placement and proportion to flag size.